Mixed groups of kindergarten students are taking over my speech room this year. While I'm continuing to push-in to many classrooms throughout my day (more on that topic when my emotional roller coaster finds a straight track), my kindergarten students are continuing to receive my support within the speech room for many reasons. It truly is the least restrictive environment for these littlest elementary students at this time. Here's my hypothetical group. Student A speaks mostly in vowels with lovely intonation. Student B smiles often and glances in my direction; however, verbalizes minimally. 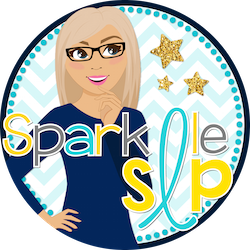 Student C has quite a lot to say with speech sound errors that should be quick to remediate and receptive language skills that still require support. Student D has energy that I would like to bottle, along with phonology and grammar targets that get addressed in between behavior modification. Just another day or should I say twice weekly 30 minute session in my speech room. I've planned books, games, card drills, craftivities, you name it. I'm juggling materials and targets and when the group leaves my room I'm ready for a nap. This too shall pass I say. This is not a new occurrence. Kindergarten students arrive every year and yet being in an elementary school just doesn't fit with the needs of these little beings. It will. They always adjust. Their teachers are miracle workers and the support staff all rise to the occasion too. While barrier activities are not a new idea, often times I forgot about their huge benefit. They keep little hands busy! You can target sooooo many goals using barrier activities. Expanding mean length of utterance. You can create your own barrier activities using stickers and coloring books. Buy multiple copies of the same coloring books and sticker packs. If you want students to take home their work, just stick the stickers onto the book. If you want them to be reusable, try laminating the pages or using sheet protectors. Do you remember Colorforms (no affiliation)? I loved Colorforms. Melissa and Doug also has reusable sticker pack sets, like these (no affiliation). You can also grab toys from home like puzzles, paper dolls, or little figures and create your own barrier activities. You can even use mini thematic erasers and picture scenes. I have made my own barrier activities and they are available in my TpT store here. 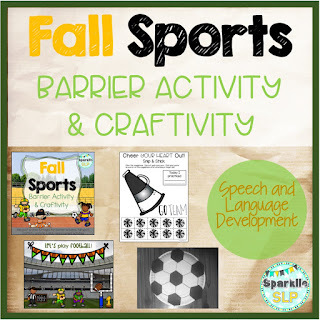 My newest barrier activity set includes football, cheerleading, and soccer. Do you use barrier activities in speech therapy? What goals do you target and what materials do you use?